The UsuryFree Eye Opener: The 24/7 Digital Footprint of "Control"
I listened to Mark Lerner who was a guest on the radio talk show on GCN Live by Pastor Butch on Wednesday, August 24, 2011. I learned that the Safran-Group which is twinned with Morpho has finalized the acquisition of L-1 Identity Solutions Inc., the leading identity management solutions provider in the United States. L-1 Identity Solutions also operates in Canada and elsewhere. L-1 Identity is the global corporation with the technology used in drivers’ licenses, and as we progress into this 21st Century, the driver’s license is already being widely used for as a national identification card. 2. A Surveillance Society or a Free Society? 5. Will National ID Protect Us From Identity Theft? Readers are invited to share this information with others in cyberspace so that we-the-people are informed and ready to resist this 24/7 digital footprint of total control. Do not be fooled, it is NOT about ‘security’ it is about the ultimate ‘control’ of we-the-people. NOTE: Readers who have any economic abundance are invited to contact Mark Lerner and offer a donation or gift to help with his work of exposing the 24/7 digital footprint of ultimate control. 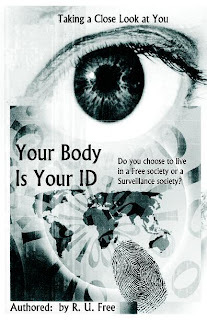 Addendum: Readers are invited to buy Mark Lerner's book "Your Body Is Your ID" to fully inform yourself, your family, friends, neighbours and working colleagues.